For the first time in more than a decade, the U.S. Food and Drug Administration approved a diet pill to aid weight loss for Americans, one-third of whom are obese. 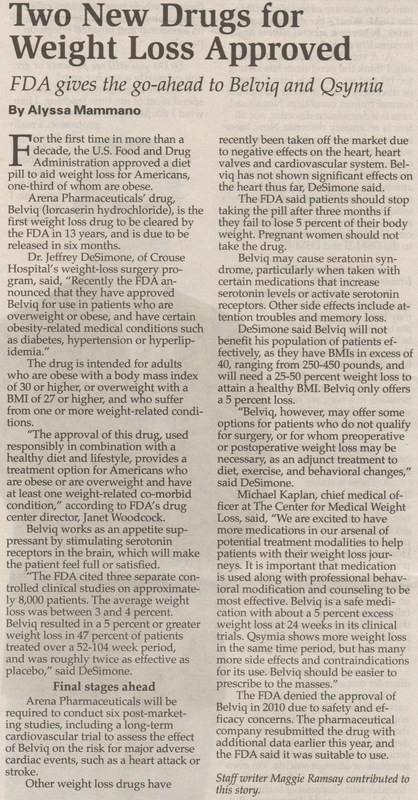 Arena Pharmaceuticals’ drug, Belviq (lorcaserin hydrochloride), is the first weight loss drug to be cleared by the FDA in 13 years, and is due to be released in six months. The drug is intended for adults who are obese with a body mass index of 30 or higher, or overweight with a BMI of 27 or higher, and who suffer from one or more weight-related conditions. “The approval of this drug, used responsibly in combination with a healthy diet and lifestyle, provides a treatment option for Americans who are obese or are overweight and have at least one weight-related co-morbid condition,” according to FDA’s drug center director, Janet Woodcock. Belviq works as an appetite suppressant by stimulating serotonin receptors in the brain, which will make the patient feel full or satisfied. “The FDA cited three separate controlled clinical studies on approximately 8,000 patients. The average weight loss was between 3 and 4 percent. Belviq resulted in a 5 percent or greater weight loss in 47 percent of patients treated over a 52-104 week period, and was roughly twice as effective as placebo,” said DeSimone. Arena Pharmaceuticals will be required to conduct six post-marketing studies, including a long-term cardiovascular trial to assess the effect of Belviq on the risk for major adverse cardiac events, such as a heart attack or stroke. Other weight loss drugs have recently been taken off the market due to negative effects on the heart, heart valves and cardiovascular system. Belviq has not shown significant effects on the heart thus far, DeSimone said. The FDA said patients should stop taking the pill after three months if they fail to lose 5 percent of their body weight. Pregnant women should not take the drug. Belviq may cause seratonin syndrome, particularly when taken with certain medications that increase serotonin levels or activate serotonin receptors. Other side effects include attention troubles and memory loss. DeSimone said Belviq will not benefit his population of patients effectively, as they have BMIs in excess of 40, ranging from 250-450 pounds, and will need a 25-50 percent weight loss to attain a healthy BMI. Belviq only offers a 5 percent loss. “Belviq, however, may offer some options for patients who do not qualify for surgery, or for whom preoperative or postoperative weight loss may be necessary, as an adjunct treatment to diet, exercise, and behavioral changes,” said DeSimone. The FDA denied the approval of Belviq in 2010 due to safety and efficacy concerns. The pharmaceutical company resubmitted the drug with additional data earlier this year, and the FDA said it was suitable to use. 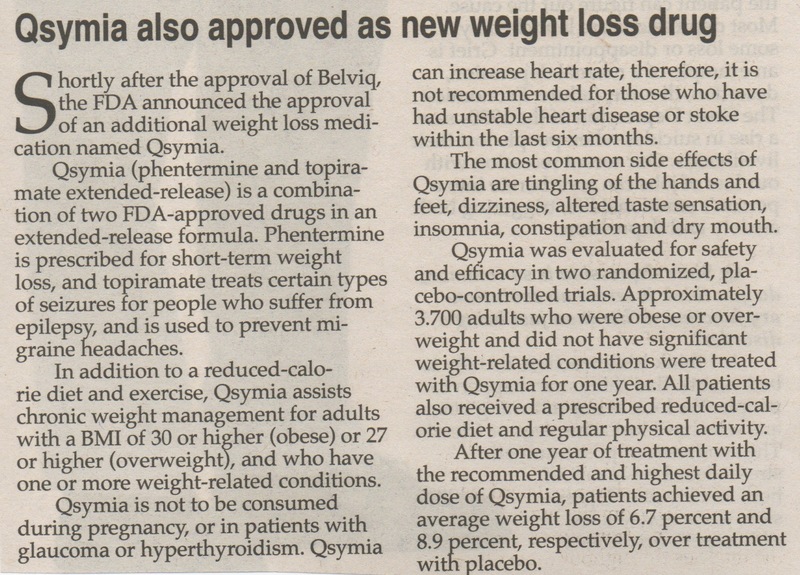 Shortly after the approval of Belviq, the FDA announced the approval of an additional weight loss medication named Qsymia. Qsymia (phentermine and topiramate extended-release) is a combination of two FDA-approved drugs in an extended-release formula. Phentermine is prescribed for short-term weight loss, and topiramate treats certain types of seizures for people who suffer from epilepsy, and is used to prevent migraine headaches. In addition to a reduced-calorie diet and exercise, Qsymia assists chronic weight management for adults with a BMI of 30 or higher (obese) or 27 or higher (overweight), and who have one or more weight-related conditions. Qsymia is not to be consumed during pregnancy, or in patients with glaucoma or hyperthyroidism. Qsymia can increase heart rate, therefore, it is not recommended for those who have had unstable heart disease or stoke within the last six months. The most common side effects of Qsymia are tingling of the hands and feet, dizziness, altered taste sensation, insomnia, constipation and dry mouth. Qsymia was evaluated for safety and efficacy in two randomized, placebo-controlled trials. Approximately 3.700 adults who were obese or overweight and did not have significant weight-related conditions were treated with Qsymia for one year. All patients also received a prescribed reduced-calorie diet and regular physical activity. After one year of treatment with the recommended and highest daily dose of Qsymia, patients achieved an average weight loss of 6.7 percent and 8.9 percent, respectively, over treatment with placebo. About 62 percent and 69 percent of the patients lost at least 5 percent of their body weight, compared to about 20 percent of the patients treated with placebo. Response to the recommended daily dose of Qsymia should be evaluated after 12 weeks to determine whether to discontinue or increase the dosage, based on the amount of weight lost by that time. If five percent of a patient’s body weight is not lost by that time, then the use of Qsymia should be discontinued. Vivus Inc., Qsymia’s pharmaceutical company, will be required to conduct 10 post-marketing tests, including a long-term cardiovascular outcomes trial to assess the effect of Qsymia on the risk for major adverse cardiac events such as heart attack and stroke.